I'm not going to lie to you. This is my least favorite time of year, weather-wise. The sky is gray. The air is cold. The trees are bare. The ground is hard. November in Alaska serves to remind you that beauty is where you find it . . .
and, most definitely, in the smiles of apple-cheeked children! Oh, your pics are JUST GORGEOUS!!!!!!!!!!! Thanks for reminding me of the beauty all around. Its my least fav time of year too. Sigh. I want to hibernate! But I am getting outside with my horses each day, making sure daylight touches my face at least once! I love your icy horse breath pic. Where did you take that? Love it! Ooooh! I love the mountain/sunrise pic! Very pretty. 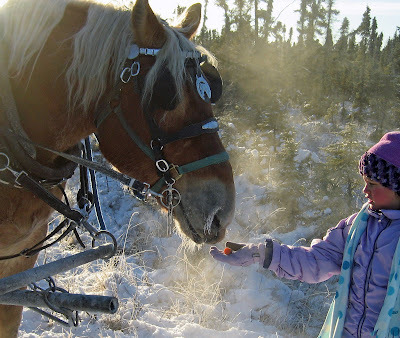 G: the horse pic was taken at Arcand Park in Anchorage, where we went on a horse-drawn sleigh ride. L: thanks! My husband actually took that shot the other morning through the window where he works! I just love your pictures. You make cold really beautiful. Although I know it has to be burr cold there right now, it is just so flippin' beautiful, I am amazed! 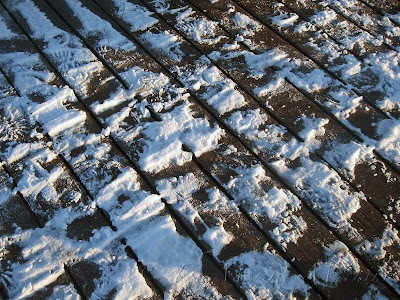 I have seen tracked in snow on a deck before, but never thought of it as picture worthy. Your shot is really cool. Beauty is everywhere, isn't it? I love your pictures! You have such a way of capturing the beauty! I know you must be freezing your hiney off but seeing those pics makes me wish we had snow here! It'd be nice if we could trade weather...it's in the 70's here with sunshine and I'm ready for the gray, gloomy cold that should come with fall. T-thanks! One of the best things about blogging is that it's helped me see the extraordinary in the ordinary, seemingly insignificant details of my life. H- I don't want to hear about your stinkin' 70 degrees ; ) It's a smidge over 20 degrees this morning. It'll get better in a month or so, when there's lots of fluffy snow to go play in. WOW! I love those pictures! So beautiful. 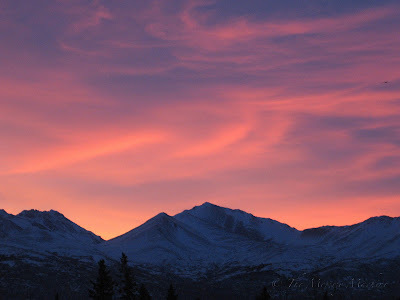 Check out my friend Wendi's blog...she is from Alaska too! The favorite pics are the ones with my darling granddaughters. Can't get enough of them!! The pic with the horse going for the carrot? from a pretty girl is awesome! And I see two angels in the other pic!! Does This Make Me an Air Hockey Mom?